Really great color! Only "freshness" on the nose, but look out! This is the pride and joy of Tidal School for a good reason. Great mixed fruit flavors, just a hint of sweetness with the 25% Grenache giving it a warmth on the tongue that is quite unexpected for a little Oklahoma blush. Very, very drinkable. Get yours now. Allens in Alva has just picked this one up. Welcome to Allen's Liquor Store! 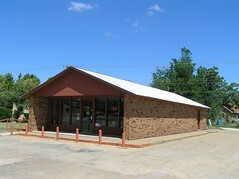 Making it easier to find and buy from the best selection of wine, liquor and beer in Alva, Oklahoma. Oklahoma State Law prevents us from shipping orders or delivering. Thanks for understanding.
. Picture Window theme. Theme images by 4x6. Powered by Blogger.